Listen to the podcast. Find it on iTunes/iPod and Podcast.com. View a full transcript or download a copy. Learn more. Sponsor: Workday. 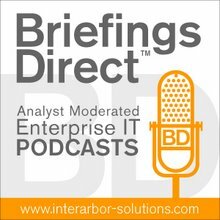 The latest BriefingsDirect podcast is an executive interview with a software-as-a-service (SaaS) upstart Workday, a human capital management (HCM), financial management, payroll, worker spend management, and workday benefits network provider. I had the pleasure to recently sit down with Workday’s co-founder and co-CEO, Aneel Bhusri, who is responsible for the company’s overall strategy and day-to-day operations. Bhusri, who also helped bring PeopleSoft to huge success, explains how Workday is raising the bar on employee life-cycle productivity by lowering IT costs through the SaaS model for full enterprise resource planning (ERP). More than that, Workday is also demonstrating what I consider a roadmap to the future advantages in cloud computing. The interview is conducted by me, BriefingsDirect's Dana Gardner, principal analyst at Interarbor Solutions. Bhusri: We're very similar to PeopleSoft in some areas, and in other areas, quite different. We have the same culture -- focused on employees first and customers second. We focus on integrity. We focus on innovation. We brought that same culture to Workday, and our customers are very happy. The pedigree of the team starts with my co-founder, Dave Duffield. He's an icon in the software industry. He's known for high integrity, innovation, and customer service. Many of us, like me, have been with him for 17 years now and we share that vision and that culture with him. We have set out to build the next great software company. Much like PeopleSoft, we are taking advantage of a technology shift. PeopleSoft benefited from the shift from mainframe to client-server. When Workday started, people weren’t as focused on how big the shift was from client-server or on-premise computing to what is now called cloud computing or, back then, SaaS. It now seems like it's even bigger than the shift from mainframe to client-server. This is a massive shift and you see it all across. That's the big difference. We are obviously leveraging a very different technology base. The thing that Dave and I both took away from PeopleSoft is that you have to stay on top of innovation, and that's what Workday is doing. We are innovating where the large ERP vendors have stopped. One of the reasons why the margins are so high for the [legacy ERP vendors] is that they are at the tail end of the technology life cycle. They are not really innovating. ... One of the reasons why the margins are so high for the [legacy ERP vendors] is that they are at the tail end of the technology life cycle. They are not really innovating. They are collecting maintenance payments. We all know that maintenance is very, very profitable. Well, when you start in a new technology, it's mostly investing. Usually, when the profitability rates get that high, it means that there is a new technology around the corner that will start cutting into those profitability rates. ... ERP is now 15 years old and just needs to be rewritten. The world has changed so dramatically since the original ERPs were written. Back then, companies were thinking about being global. Now, they are global. People were not even thinking about the Internet, and now the Internet exists. That was before Sarbanes-Oxley and before the emergence of the iPhone and BlackBerry. All these things pile together to say that it's time to go back and rewrite core ERP. It's no longer valid in today’s world. ... These last nine months have been challenging for everyone. We, as a system-of-record vendor, saw fewer projects out there. At the same time, because of our new model and the cost benefits of the SaaS solutions, we were probably more relevant than we might have been without the economic downturn. ... As the Workday system has gotten more robust, we've really focused on the Fortune 1000 companies, our biggest being Flextronics. Those large, complex organizations with global requirements have a great opportunity for cost savings. When you add it altogether . . . it averages out consistently to about a 50 percent cost saving over a five-year period. We had companies that were planning on implementing the traditional legacy systems, but could not afford it. A great example is Sony Pictures Entertainment. They already own the licenses to the SAP HR system, and yet, after careful consideration, determined they didn't have the budget to implement it. ... They will be live in five months, and they will get the benefit of about a 50 percent cost savings, if not more. They basically quoted it as one-half the time at one-third the cost. ... When you add it altogether, really do it on an apples-to-apples basis, and look at what we have taken over for the customers, it averages out consistently to about a 50 percent cost saving over a five-year period. ... The data we have now is not theoretical. It's now based on 60 of our 100-plus customers. Being in production, we have been able to go back and monitor it. The good news about our cost is that it's all-in-one subscription cost, so we know exactly what the costs were for running the Workday system. ... [Many customers] decided that they were not going to take the major upgrade from one of those ERP vendors. A major upgrade is much like a new implementation and it's cost prohibitive. With our focus on continuing innovation, they are not stuck in time. Every customer gets upgraded every four months to the most current version of the system. So as we are innovating, they are all taking the advantage of that innovation, whether it's in usability, functionality, or a new business model. I like to think about it as building at web speed, and that's how Google, Amazon, and eBay think about it. New features come out very quickly. There are no old versions of Amazon and eBay that they have to worry about supporting. It's one system for all users. We're able to leverage those same principles that they are and bring out capabilities very quickly, so a customer can identify something that's important to them. If you can get your administrative applications, your non-mission critical applications . . . delivered from a vendor . . . why not focus your resources on the core enterprise apps you have? ... I think we are a lot like Salesforce. Dave and I have a very good relationship with Marc Benioff. They're focused on CRM, and we're focused on ERP. I think the big difference is that they are focused on becoming a platform vendor, and we are really very focused on staying as an application vendor. ... If you can get your administrative applications, your non-mission critical applications -- CRM, HR, payroll, and accounting -- delivered from a vendor, and you can manage them to service-level agreements (SLAs), why not focus your resources on the core enterprise apps you have? More and more CIOs are getting that. It does free up data-center space. It also frees up human resources and IT to focus in on what's core to their business. HR and accounting don't have to be specialized in running that system. They have to know HR and accounting, but they don't have to be specialized in running those systems.